You can experience a Nitrate Spike very soon after a Nitrite Spike or just suddenly out of the blue. This usually happens when you don't manually remove nitrate through water changes often enough. Why Does The Water Always Test So High For Nitrate? 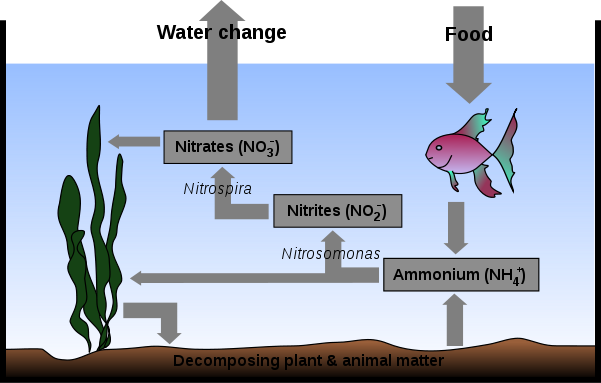 This last harmful chemical in the Nitrogen Cycle can indicate several problems in your aquarium that you must do something about. This problem occurs because you have an abundance of rotted material in your aquarium. Usually this is trapped in the substrate. Dead plants and leaves can quickly cause this issue. Catching serious aquarium problems in the Nitrate Spike stage can reduce the chance of your fish slowly developing diseases. Although plants remove nitrate from your aquarium system naturally, they cannot remove all of it. Nitrate can only be controlled by doing regular water changes and making sure that you remove dead plant matter from your aquarium. If you have high levels of nitrate in your aquarium, then you may have to adjust your maintenance schedule. Add some aquatic plants to help control the nitrate level. Nitrate levels should be below 100 ppm (parts per million). Levels higher than this for extended periods will cause your fish to slowly develop health problems. It could take a couple of closely spaced water changes to completely fix this issue. Don't be surprised if you experience a spike in nitrate right after you have a Nitrite Spike in your aquarium. For more information on Nitrate Spikes, go to Wikipedia's Nitrate page.